Like a native in Noronha, Brazil. Noronha Hospitality is second to none. 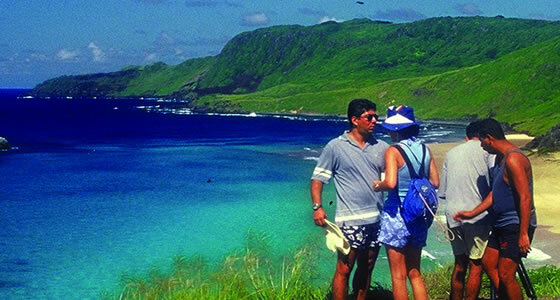 The people of Fernando de Noronha are very friendly and accommodating. The best way to learn more about their way of life is to stay at one of the family run inns or ‘pousadas’. Here you will be able to observe their daily life, the kind of food they eat and grow and learn about the problems faced by the island such as shortages of drinking water and sometimes grocery supplies.They will gladly answer questions you may have. If you meet a local fisherman he may take you out on his boat. In the evenings many locals eat at a local tapiocaria, a restaurant specializing in tapioca dishes, mainly various fillings for tapioca tortillas in the main village of Vila dos Remedios and then head to a local bar, such as the Cachorro Beach to enjoy music, sometimes performed by a local band and dance the ‘forro’ to music such as samba and axe. If you want to know what the locals are learning about, join one of the several awareness programs available on the island offered by agencies like IBAMA and TAMAR, which train the local youth and promote ecotourism and environmental conservation. There are several organic products and recycling projects which visitors can participate in.